The weather is great. Look for a few up and downs with a nice evening for Halloween then cooler air for the next few days through the weekend followed by an up time on Monday. Right now a sharp cold front looks to be moving in by next week but the timing is questionable at this time. On This Date In History: The Martians Invaded on this date in 1938…at least that’s what millions of Americans thought. A young 23 year old radio man named Orson Welles presented a show on CBS radio. He began by saying it was an adaptation of H.G. Wells’ War of the Worlds. It began at 8 pm. But a whole bunch of people were listening to Edgar Bergen and his dummy, Charlie McCarthy on NBC. Bergen’s routine ended at 8:12 and many switched to CBS. By then the radio-play was already going so they missed the opening disclaimer. Welles’ production had some sort of regular sounding broadcast with a weather report followed by some cheesy music that went on for some time before a reporter broke in with a report (I don’t think they called it “breaking news” then) and he said there were explosions on Mars. Then more music followed by another break in with a hysterical “reporter” describing ugly Martians getting into large machines that rose out of the ground with long tentacles. It reported that the machines fired heat rays and destroyed a national guard unit, dropped deadly gas bombs and they were destroying everything. People thought it was real. Some went bananas and jammed the highways looking to get out of town. CBS had Welles break in and remind everyone it was fiction, but no one listened. The panic was on. Reports of suicides came in but there was no confirmation. Congress naturally had to investigate and found nothing was wrong. Welles thought his career was over. Instead, he got a cinematic contract which led to his production of Citizen Kane which has regularly topped the list as the best movie ever made. Like Welles, sometimes we create the worst in our mind when, in fact, the best is just around the corner. If you are discouraged or feeling that you’ve made a terrible mistake, keep your head up. You don’t know what the future holds and today’s set back may just be the foundation for tomorrow’s success. Frost advisory is in effect for much of the viewing area. For points North of Caruthersville and East of Simpsonville to Bardstown, there is a freeze warning. High pressure over head will keep us crystal clear and very little wind allowing the mercury to fall. After we get our first hard freeze, then these types of advisories and warnings are no longer issued. In the South though, they are issued all season. We will warm up nicely Monday afternoon but will be chilly again Monday night. We will continue to warm up until late Wednesday when a front comes through quietly….not enough to hamper trick or treaters….and seasonal temperatures return for the end of the week. On This Date in History: The man above…Elliott Ness…was on the road to employment and history. This is something I did not know….the 18th Amendment(Prohibition) was ratified in January of 1919. But it was a moot point because apparently no one enforced it. It wasn’t until 9 months later, on this date in 1919, that the Volstead Act was passed by Congress, over-riding a veto by President Wilson. The Volstead Act provided for the enforcement of the law. I didn’t know there needed to be an act of Congress for authorities to enforce Constitutional Amendments. Anyway, the Federal Government was then authorized to enforce the law and the creation of a special unit of the Treasury Department to forcefully do so. That’s where Ness comes in. He was assigned to Chicago and had the unenviable task of taking down Al Capone, which he did for not paying his taxes on illegally obtained money. Illegal or not, you need to pay up. I wonder what he was supposed to list as his source of income on his return? I also wonder what Wilson was thinking when he vetoed the Volstead Act. I mean, part of the oath as President is to uphold and defend the Constitution of the United States. Technically, one might say that his veto was in contradiction to his oath and therefore qualified him for removal of office. That makes me wonder if anyone suggested that? Usually, if I’ve thought of something then someone else already has too, but perhaps I will investigate. Oh….one other thing not on the subject…Britney Spears. If you want to send letters of support, I suppose you can contact this Lexington Church. It made the AP wires but not too many newscasts…except perhaps in Lexington. High pressure is building in. Look for lots of sunshine over the next few days. We won’t warm above seasonal norms until Tuesday afternoon though. Look for frost Monday morning. Front on Wednesday night will probably not have enough moisture to produce much in the way of rain but will serve to reduce the mercury back to seasonal levels for the end of the week into next weekend. On This Date In History: It all started on this date in 1946. Geographically Speaking debuted as a travel show on TV. It showed travel films. It was about as exciting to viewers then then as it would be today as it only ran until Dec. 1, 1946. Real clunker. But, it was the first TV show to have a sponsor, Bristol-Meyers. And we’ve had commercials on TV ever since. 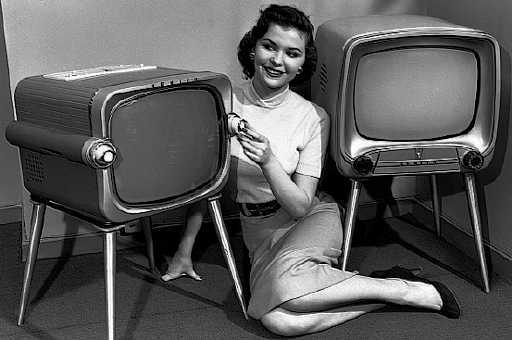 Today with everyone having a remote, advertisers have had to get more creative in order to keep us from changing channels during commercials. It’s called zapping. We see an ad and “zap” we change channels. That’s why so much money is spent on ads for TV in production. We need to be entertained as well as informed. It doesn’t work with me when there are various sports on. You people wanted rain and we got it. From a drought situation to the wettest October of all time. The upper low that got cut off from the rest of the world and wandered about the southern plains and then the southeast and then back to the lower Mississippi Valley is traversing north, passing us to the west. It will then accelerate out toward the northeast. Look for a cloudy, breezy and cool day on Saturday before the sun breaks out with avengence Sunday. It will be dry toward midweek when another front drops down. Until then, a cool Sunday will lead to moderating temperatures toward midweek. If you go and look this up, you will find all sorts of conflicting stories. 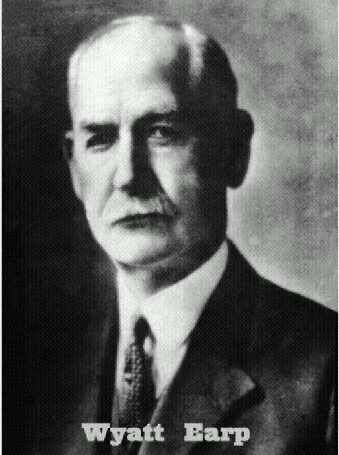 The early movies were based almost solely on the reminiscences of Wyatt Earp, who spent his later years in Hollywood as a consultant to those making westerns. So, the stories tend to lean toward Wyatt’s heroics. Later films try to be more realistic. But there is no real clear cut truth. However, one interesting aspect to the Earp lore appears to be true. That is that Wyatt, through all of his gunfights and violent episodes never once was shot. The same can’t be said of those who rode with him or against him. Wyatt died in 1929 in Hollywood, CA. Many of the western movie stars of the day attended his funeral. In a case of “be careful what you wish for” we’ve had our fair share of rain. In fact, it’s been so much that we now have set the record for the most rain in the month of October. Usually, the average October rainfall is 2.79″ and this is the driest month of the year. We are over 8.75 inches and climbing as showers remain in the forecast through the end of the week. Look for improvement for the weekend into early next week. At last check, the airport records indicated we are now less than 2 inches behind in rainfall for the year and at the NWS, we actually have an annual surplus over over an inch. On This Date in History: The war in Europe ended on this date in 1951 when a treaty was finally signed with Germany. See, Germany surrendered in May 1945 but the country was divided by the allies. Then there was the tug-o-war between the Soviets and the West over Germany and Berlin. No treaty could be signed until all of that was settled and President Truman wanted to wait to sign a treaty with a free and democratic Germany, which was finally possible some 6 years following the end of hostilities. People forget that after an invasion and defeat of a country, creating a new country and government from scratch takes time. 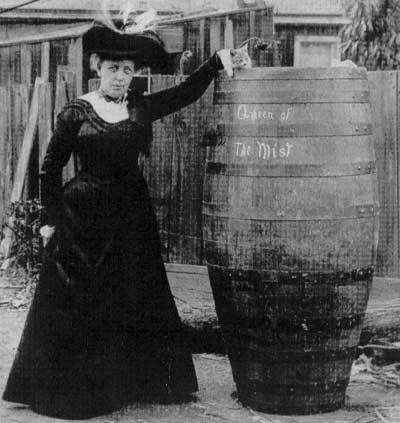 Here’s the good one…on this date in 1901, Annie Edson Taylor made history. The 63-year-old school teacher became the first person to go over Niagara Falls in a barrel. She strapped herself in a leather harness inside a 5 foot high and 3 foot in diameter pickle barrel. She had some sort of padding inside to limit injury. A fine idea when taking a plunge over the 175 foot Horseshoe Falls. She was towed to the middle of the Niagara River and off she went, bobbing to the surface and coming to shore some twenty minutes later none the worse for wear. Seems the old gal had lost her husband in the Civil War and in 1898 read about the increased popularity of Niagara Falls. In 1829 some guy had survived jumping from a cliff into the falls but no one had gone over in a barrel. She hoped the stunt would bring her fame and fortune. Well, she got her 15 minutes of fame but never made much money from the ordeal. She did inspire others to do the same thing though. Throughout the 20th century, 15 people have tried to go over the falls one way or another. Ten have survived. Jesse Sharp went over in a kayak in 1990. He died. In 1995, Robert Overcracker tried to prove technology was the answer when he went over on a jet ski. He died too. Before you get any ideas, its illegal to attempt to go over the falls so even if you live to tell about it you might be telling your story to your cell mates. Besides that, you’d probably just end up like Annie: lost to history and broke, if not broken. The final reports from last Thursday are out. The Clark County tornado was upgraded to an EF-3 tornado with winds between 138 to 165 mph. The estimate of the wind speed was toward the lower end. Still, a significant tornado. The total number of tornado touchdowns in the area was established at 7 with another confirmation in Bradfordville in Marion County. Rain rain rain. We have our chance to help the plants. A rather complicated storm system is coming out of the Rockies. It develops as a cut off low, which means the low gets stuck as the jet stream lifts up and leaves it behind to meander. Some models want to take it through to the East Coast rather quickly but for now, we’ve gone with the idea that it meanders around the Southern Plains for a few days and keeps our rain chances elevated for much of the week. If it does move out, then the rain ends on Wednesday, if not, it carries through Thursday at least. Its tough to forecast but one certainty is that we will get some good, steady rain through at least Tuesday night. And that is good news….just what the Doctor ordered. On This Date in History: The People’s Car made its debut in 1936. At that time, only one in 50 people in Germany owned a car. Adolph Hitler wanted an affordable car to help the average German get around easier and efficiently and also boost the economic development of Germany much as Henry Ford’s Model T did for the United States earlier in the century. Ferdinand Porsche developed the prototype for the Beetle and on this date it made its first test drive. The car became such a hit that even by the 1970’s it worried some Americans, not only because of its popularity as an import, but also because it was a favorite to the hippy counter-culture in the US. Eventually, Americans were more into luxury and amenities that the Beetle did not have and it fell out of favor some 50 years after its creation. However, it returned in the 1990’s in a larger souped up version with many of the features Americans are used to but its popularity never returned to its previous hey day. Notes: Hitler also wanted a vast transportation road system so people could get around. He created the first super-highway system called the Autobahn. He ulterior motive for the Autobahn was to transport troops and military hardware quickly where needed. The allies upon invasion used the Autobahn for exactly that purpose against the Germans toward the end of WWII. General Dwight D. Eisenhower was so impressed that, when he became President, he initiated the construction of the US Interstate Highway system. It was a great aid to the economy in that it allowed for the quick and efficient distribution of goods, materials and people to their destinations. Further, in time of need, it would allow for the quick transfer of military necessities in a time of crisis. Also….remember the Volkswagen Thing of the 1970’s? I know in the 1980’s they were still popular in Mexico as taxis. They had their inspiration from another Nazi era automobile, the German Staff car. What you see above are photos of the small tornado that briefly affected the Crescent Hill region of Louisville. They were taken by John Fogel, Jr. of Clarksville. The lower small photo(sorry I couldn’t make it bigger) shows a very small rope like funnel cloud. The photo above is less distinct but you can see it as it retreats. The parent storm is racing NE and the funnel is trailing behind as it ascends. There were 44 tornado warnings for 19 counties. 10 counties had multiple warnings with Breckenridge leading the way with 7 warnings. Perry had 5 warnings and Meade and Breckenridge had 4 each. Six others had 2 or more. So far, tornadoes have been confirmed in Jefferson(KY), Perry, Breckenridge, Meade, Bullitt and Clark counties. The one if Louisville was an EF-0 with winds of just 65 to 85 mph. The others were either EF-1 or EF-2 with the former generally around 107 mph and the latter between 120 and 135 mph. The one in Clark county near New Washington was initially set as an EF-2. However, after the assessment team from the NWS saw our video from our helicopter and after receiving other information, they are holding off making a final determination until after further examination of the damage. Clearly visible from the chopper one can see a path cut in the ground and they found the path was much longer than the original assessment had found. Often in rural areas, its very difficult to ascertain a complete picture from the ground, especially in areas without trees or buildings. On Thursday night, there were multiple super cells. Each one was rotating, some of them quite violently. Any storm in that environment exhibiting such characteristics have the potential to do one of three things: Create gusty winds, draw down damaging winds or draw down a tornado. In at least 20 cases there was wind damage. In at least 6 instances, tornadoes touched down. It was unfortunate for those who suffered damage to their homes and businesses, but we in the larger population centers were lucky they didn’t strike. Had the tornado that touched down in Clark County been about 20 miles farther southeast, Louisville would have suffered some serious damage or worse. The NWS has to make a determination whether to issue a warning and what type. Had they not issued warnings for the super-cellular storms and they caused damage or spawned tornadoes, there would be outrage. They have the technology to determine potentially dangerous situations and they would be remiss in their duties if they did not exercise their duty. We in the Advanced Warning Weather Center have the technology and expertise to do exactly what our title suggests: give you advanced warning. If we simply ran a crawl, which is never the same as showing exactly where storm is, when we have the ability to do so, we would be remiss in our responsibility. We can show exactly where a storm is, down to the street level. If we did not use that ability and do our best to serve everyone in need, then having the technology and people who know how to use it would be moot. Our policy is to be on the air whenever there is a tornado warning in our area and will stay with it until the warning expires. We feel like that, no matter where you live, in a small town or large, each individual deserves the same respect and consideration. If you did not get damage or strong winds, be thankful. There were 6 confirmed tornadoes. The assessments are still being done and there potentially could be a few more. The lack of damage was not because it was not dangerous or the warnings were not warranted, it was simply the luck of the draw and the stronger tornadoes were in relatively sparsely populated areas. We know that we may not be so lucky next time and some people this time were not as fortunate as others. While I am not the policymaker, I am confident that our policy of respecting the concerns of those in potential peril and using every resource at our disposal in their aid, I suspect, will not change. If a tornadic thunderstorm is coming down your street, I’m sure you wouldn’t want it any other way. Here is the latest summary of tornado assessments from the NWS. click on the county of your choice for the details. The second link is the general site for the local NWS office. The top picture is the overall risk for severe weather. The moderate risk encompasses the entire viewing area. The second map is the risk for tornadoes. We are on the edge of the 15% region. The lower map is the damaging wind risk outlook and we are just outside the 45% area. In other words, nothing has changed much since Tuesday. We do have sunshine breaking out this early afternoon. That will tend to destabilize the atmosphere ahead of the cold front that will come through later tonight. I mentioned yesterday the possibility of storms to our south being so strong they would cut off much of the moisture and energy in the Ohio Valley. Midday, Pensacola had a bunch of big storms that produced a big tornado. North of that, there wasn’t much activity. However, to the west of the Florida Panhandle, activity along the coast and inland was much more scattered in nature. If these storms do not get more concentrated, then that would probably not cut off the moisture from the south, thus enhancing our prospects. Further, there is one computer model that has severe parameters in our area set pretty high across the board. However, other models are not so aggressive and it is still possible that the storms to our south will become more concentrated. Note the risk for strong winds here from the Severe Storms Prediction Center is less than 45%. The risk for tornadoes and hail is 15%. It is still not a slam dunk for anyone. But, with the available wind energy as well as the parameters that may open up with the sunshine and potential moisture from the south, it is certainly possible any where in the area. Still calling for between 9pm and 3am, the early side for folks to the west and later time for people in the east. Isolated super-cells are possible. It is a fair bet that it will all end with a line of storms. Super-cells do produce the large destructive tornadoes and a line of storms will often spin out little small, short lived tornadoes. Those are weaker but are more frequent and generally come about with less warning and are therefore considered by many to be more dangerous. As for tornadic activity, the spin ups along the line will be a chief concern but high winds associated with the storms will be the greatest risk. Hail has also been reported in these storms over the past few days. Its probably a good idea this afternoon to pick up loose branches and sticks in the yard as well as putting away yard furniture and kids outdoor toys. Secure any loose items as flying debris often causes decent damage and can cause injury. Put cars in the garage or car port to protect from hail or other flying debris. Should tornadic weather develop in your neighborhood, make sure your family knows where to go for safety in your home. Its probably not a bad idea to have a drill or plan well before any severe weather so, if nothing else, this may be a good excuse to have a review. Keep in mind when looking at the above maps, the SPC risk for anything is less than 50/50. However, its probably wise to heed precautions. I won’t be able to update this again today as I will be busy in the weather center. WLKY.com will have all of the updates as far as any watches or warnings. You’ll find us on Newschannel 32 whenever there is any risk with updates and continuous converage as necessary. These pictures are easier to see than yesterday’s but they say essentially the same thing. The moderate risk area was expanded today to parallel and just south of the Ohio River. It generally encompasses the entire viewing area but we remain on the fringe of the risk area. Notice, the moderate risk area has a 45% probability as deemed by the SPC. That is less than 50/50. The main energy and area where all of the ingredients come together is to our Northwest with the main area being the axis from Indy to Springfield, IL. There is also the remnant of a low coming off the Gulf to our south. One scenario that is possible is that there is big stuff to the north and stuff to the south that cuts off much of the energy in our area and we don’t get much. While I think that is possible, it’s probably not wise to count on that. My best recommendation and analysis is consistent with previous observations. Recognize that we will probably get strong storms coming through on Thursday night. Our best timing outlook at this point is between 9pm and 3am. Yes, there is a tornado threat but given that the best dynamics are to our northwest, that is where the biggest hubbub should be. We will probably be looking at strong storms, maybe even a line of storms, with high winds. That can and does cause damage and can be dangerous. There will be a threat of isolated tornadoes. Primarily, when you get a line of storms, small, short lived tornadoes often pop up with little warning. Our VIPIR radar and Advanced Warning Doppler Network are both very very good at picking up these little items as they form. That is why I would suggest keeping tuned to Newschannel 32 to see exactly where these little critters might be. To further toot our own horn, you can have all of the radars in the world but if you can’t interpret it properly, then its not worth much and can lead to over reaction or to dangerous non-chalance. I’ve been doing this for over 20 years and I can tell you the commercials you see are not bogus. Jay Cardosi is an Ace when it comes to severe weather and recognizing what is worthwhile and what is not. There is no one I’ve ever worked with who is better. When situations like this arise, Kim runs the radars and Matt is in constant communication with the NWS and the newsroom gathering all sorts of information. I will be on hand helping to operate the radars as well as assisting in the analysis. While Jay is concentrating on current activity, I am free to look at other developments and bring those situations to Jay’s attention or directly to you. It is truly a team effort. Having said all of that…anticipate a potential round of strong storms. The biggest threat will be high winds. Isolated tornadoes will be possible. By no means is it a slam dunk that we get wiped off the map but there is a pretty decent threat of problematic conditions tomorrow evening. One thing that may determine just how problematic could be the amount of sunshine we get. We’ll probably get some rain late Wednesday night and early Thursday morning. Presumably, we’d get some sun in the afternoon. But if we don’t, then that may be an inhibiting factor. Sun in the afternoon and activity moving in sooner rather than later would be the optimum situation. This is a little small but the area in red is the “moderate risk” of severe weather for Thursday. It is very unusual for the SPC to issue such an area 72 hours in advance. This came out early Tuesday morning. In my mind, its too soon. There are a number of things that need to come together for this event to unfold in the Ohio Valley. Granted, the area outlined is from our area along the Ohio River and up toward the Northwest. This would coincide with what the data suggests and with our area on the fringe typically indicates the possible not probable range. I would agree with that and the idea that northwest of us is more likely a target is good. But to make such a claim 72 hours in advance is, in my view, really pushing the area where they may get in trouble because there are so many variables at play. Having said all of that…another school of thought is that, since the SPC typically doesn’t do this at 72 hours, confidence must be high. And I will tell you, the data is pretty consistent in creating very strong wind dynamics. That will happen in all likelihood. My guess is that is why they put this out this soon just to get everyone’s attention. The thing is as far as we are concerned, there are many ingredients that need to come together to create a tornadic situation and that is very far from conclusive at this time. Perhaps it will be more so tomorrow. However, its probably a fair bet we will get some strong storms in the way of strong winds late Thursday. The later in the night it is, the lower the prospects. A few hours either way could make a lot of difference. So, my advice is what it was yesterday….don’t head for the cellar just yet. Keep in tune to Newschannel 32 and we’ll help separate fact from fiction and I’ll certainly let you know if its something I would be very concerned about. Remember, I’m married now and a home owner so these things are just as important to me as it is to you. For now, its certainly worth being interested and informed about, but not worth selling the ranch and moving to Australia. Possible, not probable for tornadic activity and much more likely for strong storms with strong winds. Thursday is my normal day off but as of now I am operating under the assumption that I will be in to work on that evening. We’ll see how it shows itself tomorrow.